For those who don’t know, I am a massive fan of anything old Hollywood. Anything about the movie business from its birth to the 1960’s I am in love with. Not that I don’t love movies in the time after the 1960’s (as it would be strange if I was as committed to Movie Critical as I am and I hated modern film), but I truly love the Golden Age of Hollywood. The stars, the films, the film makers and the style. Whenever a film comes out that has anything remotely to do with this era, it is something for me to get excited about. A film about Orson Welles? I’m there! 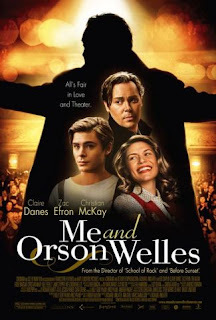 Unfortunately, I would be surprised if many of Zac Efron’s fans who would have rushed out to see their heart throb’s new film would have known who Orson Welles was before they saw this film. Personally, I think the man was a genius. He was brilliant in “Citizen Kane”, “The Third Man” and “The Lady From Shanghai” and the man was at his best directing two of these three films. Although “Me And Orson Welles” isn’t completely true to life, there are many accuracies throughout. Firstly and most importantly, Mr Welles was known to be extremely hot headed and very hard to work with at times. He knew he was great at his job, but he can be forgiven considering he was as much of a genius as what he thought he was. For those of you who haven’t seen “Citizen Kane”, do me a favour. Hire it out and then try to tell me that he isn’t a genius. Some of you may be asking “If you were so excited about the movie, then why did it take you so long to see it?” Well, believe it or not, it actually only taken me less than a week to see it without illegal download. “Me and Orson Welles debuted at the Toronto International Film Festival in September 2008, opened in the United States in March 2009, the UK in December 2009 and long and behold, Australia in August 2010. I have no idea why it took this film to get here, but it doesn’t look good for some movie patrons knowing this piece on information. My other half was very sceptical of the quality of this film, because his theory is that if a film takes so long to be released here, it can’t be that good. Well, these are my own words and here is my review. Orson Welles. The man was larger than life in stature as well as in presence and this is perfectly captured on the screen in Richard Linklater’s latest film, “Me And Orson Welles”. Adapted from the novel of the same name by Robert Kaplow, this film is light and fun, but is superior to other films which are seen as light and fluffy. It is able to bring a tear to your eye for reasons other than soppy romance scenes and has some stellar acting. 17 year old Richard Samuels (Zac Efron) is like any other school kid dreaming of acting stardom in New York City when he has an amazing stroke of luck and is cast in the newest Orson Welles (Christian McKay) production at the Mercury Theatre, Julius Caeser. The production looks like it is destined to be a failure due to the unprofessional nature of Welles and his over the top personality. Despite the pandemonium, Samuels falls in love with his new occupation and also with production assistant, Sonja Jones (Claire Danes). However, it doesn’t take him long to realise that the world of Broadway is not as pure as he would have liked it to be and that Welles is the man, in many different ways. “Me And Orson Welles” is definitely a fun watch. It is not as heavy or emotional as it could be, but the film would not be as fun to watch if it was. It captures the true essence of Broadway in the 1930’s and has many accurate references to the time. It is obvious that director Linklater, screenwriter Holly Gent Palmo and author Kaplow did a great deal of research when piecing together the screenplay, which is evident considering “Me And Orson Welles” is a great period piece. The script it witty and extremely well written. However, it can be a little cheesy in parts and seem very rehearsed , rather than flowing the way a film should. The characters in the film are all colourful and great to see on the screen. Zac Efron takes on a role in “Me and Orson Welles” unlike any other he has done before. At times he still oozes the same cheesy charm that has made him famous in the “High School Musical” trilogy, but then he also shows the making of a fine actor. He has moments of brilliant acting as the movie goes on. Though it would be great to see him in a film where he doesn’t sing or dance at all. However, he is perfect for the role of Samuels. The star of the film is undeniably Christian McKay. In only his first big screen appearance, he gives an amazing performance that Welles, the man, would be proud of. He uncannily resembles Welles physically, vocally and in attitude. He does something which every great actor should to do, he makes the audience hate him, and then love him. They want him to fail, but they also want him to succeed. McKay definitely deserves all the praise he has received. Ben Chaplin is also a standout in his role as cast member George Coulouris, as he gives a stunning performance. It is refreshing to see a fun, but serious at the same time film to be released which has all the features of a backstage musical, bar the music. Fans of theatre will definitely enjoy this film, as will fans of Welles himself and of the Broadway of yesterday. Christian McKay carries the film with his brilliance and gives a performance which one will not be able to help remembering when thinking of Orson Welles. “Me And Orson Welles” may seem like an interesting choice for film maker, Richard Linklater, but definitely not a bad choice. The strangest thing for me about this film was Claire Danes. She doesn't exactly strike me as the sort of girl guys fight over. That said, you are right to assign brilliance to McKay - his performance is the stuff of legend that not nearly enough people saw. Oh - and I must award the film high marks for the cheeky THIRD MAN reference. Great write-up! I missed it in the theatres...can't wait to see this one. And yes, Orson was certainly larger than life...McKay looks terrific in this. Finally saw it! Hatter is right. Danes is not at all a pleasure to look at. Why the hell was she cast in this??? Total misfire there. Having said that, a very sweet coming of age story that I truly enjoyed. McKay was outstanding and hits the Welles persona very nicely. They make him out to be a real creep here! Nice write up and makes more sense now that I've watched it.